We’d love your help. Let us know what’s wrong with this preview of The Crisis of Islam by Bernard Lewis. In his first book since What Went Wrong? Bernard Lewis examines the historical roots of the resentments that dominate the Islamic world today and that are increasingly being expressed in acts of terrorism. He looks at the theological origins of political Islam and takes us through the rise of militant Islam in Iran, Egypt, and Saudi Arabia, examining the impact of radical In his first book since What Went Wrong? Bernard Lewis examines the historical roots of the resentments that dominate the Islamic world today and that are increasingly being expressed in acts of terrorism. He looks at the theological origins of political Islam and takes us through the rise of militant Islam in Iran, Egypt, and Saudi Arabia, examining the impact of radical Wahhabi proselytizing, and Saudi oil money, on the rest of the Islamic world. To ask other readers questions about The Crisis of Islam, please sign up. Listened to this traveling to and from St. Louis on our recent Thanksgiving trek back to visit family. The author is also the reader and he does an excellent job. Learned so much* it was hard to take it all in with just one listen. Want to return to it again. And yet even one listen was eye-opening. Given my limited understanding of the long and complex Middle East political situation, Mr. Lewis seemed to do a fair job presenting many sides, not just the Western perspective. In fact, he was ofte Listened to this traveling to and from St. Louis on our recent Thanksgiving trek back to visit family. The author is also the reader and he does an excellent job. Learned so much* it was hard to take it all in with just one listen. Want to return to it again. And yet even one listen was eye-opening. Given my limited understanding of the long and complex Middle East political situation, Mr. Lewis seemed to do a fair job presenting many sides, not just the Western perspective. In fact, he was often quite critical of America and her allies. Also want to read What Went Wrong? The Clash Between Islam & Modernity in the Middle East when I finish rereading this. I am trying to gain a better understanding of why some Islamic nations and people of those nations have an intense hatred of American ideals, culture, and foreign policy. I think this book did an excellent job better informing me about the complex hisotry of Islam,the role the Soviet Union played in the Middle East, the Jewish/Arab conflict, the priciples of jihad, and explained about the various sects of Islam and their extremest teachings. I now better understanding about how Islamic fundamenta I am trying to gain a better understanding of why some Islamic nations and people of those nations have an intense hatred of American ideals, culture, and foreign policy. I think this book did an excellent job better informing me about the complex hisotry of Islam,the role the Soviet Union played in the Middle East, the Jewish/Arab conflict, the priciples of jihad, and explained about the various sects of Islam and their extremest teachings. I now better understanding about how Islamic fundamentalists think and their rationale for the tactics that they use. I also have a clear understanding about their short term and long term goals are. One of the major issues is the distain for many moderate leaders of Islamist countries, such as Saddat in Egypt and the leaders in Saudi Arabia. These rulers are seen as disloyal to Islam for signing treaties with Israel, allowing "infidels" onto their soil, and working with Americans. I also found it interesting to learn how the discovery of oil and the wealth it created in Saudi Arabia acted as the finiancial backbone of the islamic movements. Currently, the official type of Islam in Saudi Arabia is Wahhabism (a conservative 18th century reform movement of Sunni Islam) and as Saudi Arabia became more rich it began establishing Wahhabist centers around the Middle East and in western nations preaching the more conservative and pure form of Islam. At one point the author gives a series of statistics comparing specific Islamic countries and then all Islamic countries in general to the rest of the world in terms of economic growth, income/capita, living standards...etc. Every time western nations with 1/5th or fewer the populations of muslim nations were as or more productive. A short 125-page focused book that honestly and hence in a balanced manner analyses Islam's relationship with the West. So many cobwebs cleared, so many things learnt; unbelievably in such a short book ! 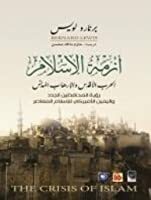 الكاتب قارئ ومطلع جيد على التاريخ الإسلامي، أنصفنا في أكثر من نقطة، وبالأخص في فصل " ما هو الإسلام؟ " ، فهو على الأقل لم يدلس، وعرض وجهة نظر الإسلام كما هي، وإن كان كلامه في المجمل ضدنا. حذر من إطلاق التعميم فيما يخص العالم الإسلامي، ثم أتى وخلط بين مواقف الحكام والشعوب، بين مواقف السنة والشيعة. لكن يظل أكثر ما أثار سخريتي واستفزازي في نفس الوقت نقده لكراهية المسلمين لأمريكا، أمريكا البريئة، والتي دلل بها على تناقضنا الصارخ كمسلمين. فذكر من الأمثلة: في الوقت الذي كانت تبطش به روسيا بمسلمي أسيا الو الكاتب قارئ ومطلع جيد على التاريخ الإسلامي، أنصفنا في أكثر من نقطة، وبالأخص في فصل " ما هو الإسلام؟ " ، فهو على الأقل لم يدلس، وعرض وجهة نظر الإسلام كما هي، وإن كان كلامه في المجمل ضدنا. فذكر من الأمثلة: في الوقت الذي كانت تبطش به روسيا بمسلمي أسيا الوسطى، كان مسلمو البوسنة في حماية المروحيات الأمريكية، وفي الوقت الذي سارعت فيه روسيا للاعتراف بدولة إسرائيل، ترددت أمريكا في هذا القرار .. كل هذا لم يمعنكم أيها المسلمون من توجيه اللوم لأمريكافي حين مددتم أواصر العلاقات لروسيا. أمثلته هذه دليل على الاجتزاء وكأنه لا يعلم شيئاً عن السياسة الأمريكية، السياسة القائمة على دعم الانقلابات، وإشعال الفتن، سياسة دعهم يقتلون أنفسهم بأيديهم. This is very bad journalism. Stacked with miss-quotes, and downright lies. Pure fear mongering. Book like this appeared ib the 1930's in Hitler's time. The author should be called to account. This is not just an opinion its propaganda. I liked that that author is greatly knowledgeable about the Arab history and Islam, he should have been much able to detect the reasons for this crisis that Islam currently passes through. Yet, I felt that book is a kind of being propagandist to Israel and its unconditional support by the U.S., instead of considering them as a main pillar of the crisis. 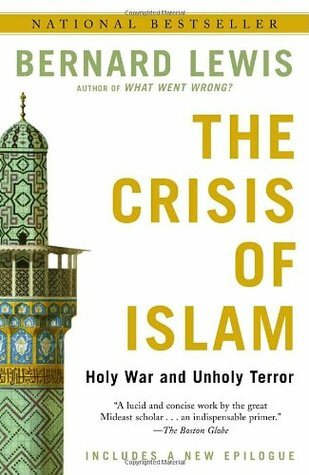 The title of the book isn't really focusing on Islam and its crisis as such. It rather focuses on the U.S. handling to this problem. The book also I liked that that author is greatly knowledgeable about the Arab history and Islam, he should have been much able to detect the reasons for this crisis that Islam currently passes through. The book also provides a smooth narrative line, but it doesn't really end up with concrete solution with the U.S. problem with Islam. The author is wary about the so called "Islamic terrorism" but isn't annoyed at all with any other atrocities committed by the Western countries or Israel in the Middle East, and that initiated the deep - rooted feeling of agony among Muslims. This feeling is attributed to be the main source for any terrorism to happen in this region. Princeton's Bernard Lewis is one of the most respected subject matter experts on the Middle East, well known the world over. This book was written three years after the War on Terror began, and does a masterful job of explaining the cultural rifts between Islam and the West, and the rise of Islamofascism. If you want to know the real reason victory in Iraq and Afghanistan, and in the entire Global War on Terror is so critical for global security, this book is a must read. I have read this book at Princeton's Bernard Lewis is one of the most respected subject matter experts on the Middle East, well known the world over. This book was written three years after the War on Terror began, and does a masterful job of explaining the cultural rifts between Islam and the West, and the rise of Islamofascism. This was similar to "The Art of War" in that it was chock full of common sense. And if you possess common sense, you don't need to be told why certain groups hate Americans and our ideologies (hell I'm not so crazy about us either, at times), why World Powers will always need an enemy, and why Holy Wars are older than the Muslim world. I'm not questioning the author's validity, but if you are seeking an in-depth history lesson of the Middle-East (as I was), this is not it. I wish this book was a bit longer, but it gets right to the point and makes you feel like an idiot for following the mainstream public stereotyping of Islam. If you want to know why so many muslim extremists hate the west (especially United States) read this book. This is certainly a good historical account of the events that underpin the shift toward Islamic radicalism and terrorism. I wish I’d read it sooner — it was published in 2003 — but life got in the way. Lewis does address some of the Koranic scriptures in trying to describe some of the actions of the most radical fundamentalists in Islam, so I cannot find fault there. However, I thought he could have gone much deeper by addressing the curriculum in madrassas, sermons by imams, and use of Koranic This is certainly a good historical account of the events that underpin the shift toward Islamic radicalism and terrorism. I wish I’d read it sooner — it was published in 2003 — but life got in the way. Lewis does address some of the Koranic scriptures in trying to describe some of the actions of the most radical fundamentalists in Islam, so I cannot find fault there. However, I thought he could have gone much deeper by addressing the curriculum in madrassas, sermons by imams, and use of Koranic scriptural interpretations (as well as what is used in the Hadith) that aided the shift toward radicalism. Honestly, I knew most of what I heard in Lewis’s reading in “Crisis.” I’ve been paying attention to these issues since well before 9/11. But this isn’t a shortcoming in this book, nor is it a criticism. Yet there was more for development of the (violent) faith aspect to accompany the historical events. Lewis is perhaps the foremost scholar on Islam and the Middle East. Right after 9/11 he did a couple of quick books - What Went Wrong and then this book. 1) Islam fits historically between Judaism and Christianity. But it is different in some key ways. First, the key text in Islam is attributed to one prophet - both the new and the Old Testament have many writers. Second, Islam does not have ordination in a formal sense - that allows for Lewis is perhaps the foremost scholar on Islam and the Middle East. Right after 9/11 he did a couple of quick books - What Went Wrong and then this book. 1) Islam fits historically between Judaism and Christianity. But it is different in some key ways. First, the key text in Islam is attributed to one prophet - both the new and the Old Testament have many writers. Second, Islam does not have ordination in a formal sense - that allows for some wide interpretations. Third, the concept I. Mark - render unto Caesar that which is Caesars does not work in Islam. Nations are subordinate to the religious law. The concept of one man one vote becomes one man one vote, once. Once an Islamic state is established no further democracy is necessary. 2) Islamic organizations are not like other alliances. The members of the Organization of Islamic Countries are a strange mix. When the soviets invaded Afghanistan the OIC did not do anything. 3) The comparison of Islamic states to the rest of the world are stark. They rank far down in development. One statistic stuck with me - since 900AD there have been about 100,000 books translated into Arabic - that compares to translations in Spain which exceed that number in one year. 4). The Nazis tried to involve Islamic states in their efforts. Writers like Rilke and Heidigger condemned the West as "soulless" that fit into the narrative of the current terrorists. 5) The concentration of wealth in the Saudis helped to fund schools and other foundations around the world that espouse an especially pernicious version of Islam. The book goes through the history of a number of Middle Eastern countries to show their development. There are very few public schools in the Middle East so much of what passes for education. Is controlled by people who link one brand of Islamic faith and money. 6) The US gets caught up in the rhetoric of the terrorists in part because we are perceived as successors to the colonialists (we do not get credit for our interventions in places like Bosnia). But also the European narrative of the US as a soulless place works against us. 7) He offers a comparison - most Moslems are not fundamentalists, and most fundamentalist Moslems are not terrorists. But almost all terrorists are fundamentalist Moslems. That requires us In our responses to make some careful distinctions - not at all like either Trump or Obama. Lewis is among the foremost scholars of the Middle East in the world. In recent years it has become fashionable to cast doubt on him because of his supposed support for the Iraq War or his advising the Bush administration. Such doubt is nonsense. Read his work and judge it for yourself. He knows his stuff. This book is his attempt to explain, in brief, what cultural and historical factors could lead to 9/11. The amount of learning he brings to bear is massive, but his thesis is relatively straig Lewis is among the foremost scholars of the Middle East in the world. In recent years it has become fashionable to cast doubt on him because of his supposed support for the Iraq War or his advising the Bush administration. Such doubt is nonsense. Read his work and judge it for yourself. He knows his stuff. This book is his attempt to explain, in brief, what cultural and historical factors could lead to 9/11. The amount of learning he brings to bear is massive, but his thesis is relatively straightforward. He explained it in "The Roots of Muslim Rage" more than 20 years ago. In his view, the problem stems from the Islamic world's failure to confront the challenges of modernity. The UN's Arab Human Development Report more than corroborates his thesis. Bernard Lewis is certainly one of the most renowned and respected scholars of Islam and the Middle East. This book, unfortunately, was not as long as I would have liked it to be. That being said, he does cram a great wealth of information into such a small volume. The only criticism I h Bernard Lewis is certainly one of the most renowned and respected scholars of Islam and the Middle East. This book, unfortunately, was not as long as I would have liked it to be. That being said, he does cram a great wealth of information into such a small volume. The only criticism I have and what earns it a four star rating instead of a five, is that near the end he glosses over certain aspects of mainstream Islamic theology and doctrine, such as abrogation, as wrong without providing an argument against it, which I do understand as this is more of a general overview;however, if someone mentions something as wrong, then one expects that the author would spend sometime on it. That was disappointing. A primer on Islamic history and culture. Helps westerners grasp the arguments terrorists are making. Shows suicide, targeting civilians, and killing fellow Muslims are clearly Islamic sins. In most Muslim countries Islam is still the main religion where in Christian countries Christianity does not hold the power like they once did. This book tries to discuss Islam away from radical Islamic terrorist and more of the history and culture and the overall background. A great primer on the history of Islam through the 20th century. Very good for the first 8 chapters, but weaker in the final chapter ("The Rise of Terrorism"), and the Afterword could have been assembled from Bush/Cheney/Rumsfeld speeches. The public debate in the U.S. would be miles more productive if everyone in the country read this book. This book made me realize I know little to nothing about the history and politics of the Muslim world. Now the current state of affairs begin to make sense. Clash of civilizations sounds about right. Hang on to your hats and hijabs! Looks like the Muslim world and the West are in for a rough ride for quite some time. This is an evenhanded and insightful explication of Islam in our time. Lewis masterfully threads a combination of perspectives together into a tightly woven cloth: history, Islamic jurisprudence, contemporary developments, the implications of terrorist activity, and the plight of the Muslim people if their fundamentalist overlords win their battle with the West. This is a great and informative book, short but to the point. Lewis has an in depth knowledge about the religion and the issues it currently faces. For anyone who is looking to learn more about islam as well as islamic extremists and terrorists, this book is a must read. Great read, Lewis packs a lot in this little book (140 p). He gives background history of Islam and the Middle East. He then brings the situation up to present day events and application. A must read to get the pulse of current day events in the Middle East & Islam. This guy is billed as a conservative, but he seems to have a solid knowledge of Islam and the Middle East. This book is short, easy to read, and a good introduction to the thoughts and actions that have brought us to the present situation. simple overview of the history of islam, what they believe, and the motivation behind radical jihad. interesting to learn that at one time the islamic empire was strong and thriving and has since been the victim of poverty in an industrialized western world. A great, objective, and succinct review of the history of the relationship and attitudes between the Arab world and the West, the US in particular. Good history to know. Thought-provoking. Easy-to read. Judging from other reader reviews, Lewis is certainly a love him or hate him kind of guy. Regardless of what you think of him personally and whether you agree with him or not, his scholarship is excellent and his opinions should be taken seriously. The most rational and sane analysis of Islam's relations with the West. Highly recommended for anyone who wants to know the real reasons behind the current gloomy terror scene. Far from the ostrich like attitude of most commentators, this is straightforward and to the point. Must read. As soon as I finished this book, I took the phone off the hook, and sat in the lotus position to calm myself down. The book provides a nutshell overview of the background dynamics at work in the Islamic world. Though he more implies than explicitly states why we are involved, Lewis is good at describing the ineptitude of the western and U.S. policies in this part of the world – the imposition of artificial country boundaries, the taking of sides in a highly factionalized Islamic world, the backing of dictators, the turning of our backs on former allies when they no longer served our interests, etc. Lewis ide The book provides a nutshell overview of the background dynamics at work in the Islamic world. Though he more implies than explicitly states why we are involved, Lewis is good at describing the ineptitude of the western and U.S. policies in this part of the world – the imposition of artificial country boundaries, the taking of sides in a highly factionalized Islamic world, the backing of dictators, the turning of our backs on former allies when they no longer served our interests, etc. I sort of wish this book had come with a sticker along the lines of "DISCLAIMER: this dude was a close policy advisor of the Bush administration and favored military invasion of Iraq", but ultimately I think the blow sustained to whatever Leftist Cred/Purity I had was more than compensated for by the boost to my basic geo-political literacy. - For a book of popular nonfiction, it's refreshingly direct and dense - I probably learned more about the Mi I sort of wish this book had come with a sticker along the lines of "DISCLAIMER: this dude was a close policy advisor of the Bush administration and favored military invasion of Iraq", but ultimately I think the blow sustained to whatever Leftist Cred/Purity I had was more than compensated for by the boost to my basic geo-political literacy. - Bernard Lewis is as unsentimental of an analyst as they come; neither an apologist nor a crusader. You don't get the sense from reading him that he takes the superiority of Western, liberal democracy as self-evident, and he doesn't seem all that interested either in condemning the atrocities of modern terrorism just for the sake of putting the West on a moral high ground. Bernard Lewis was the Cleveland E. Dodge Professor of Near Eastern Studies Emeritus at Princeton University and the author of many critially acclaimed and bestselling books, including two number one New York Times bestsellers: What Went Wrong? and Crisis of Islam. The Middle East: A Brief History of the Last 2,000 Librarian Note: There is more than one author by this name in the Goodreads database. “Different groups in the [Middle East] drew two lessons from [return of the shah in Iran] - one, that Americans were willing to use both force and intrigue to install or restore their puppet rulers in Middle Eastern countries; the other, that they were not reliable patrons when these puppets were seriously attacked by their own people, and would simply abandon them. The one evoked hatred, the other contempt - a dangerous combination. The value of Israel to the United States as a strategic asset has been much disputed. There have been some in the United States who view Israel as a major strategic ally in the region and the one sure bastion against both external and regional enemies. Others have argued that Israel, far from being a strategic asset, has been a strategic liability, by embittering U.S. relations with the Arab world and causing the failure of U.S. policies in the region.